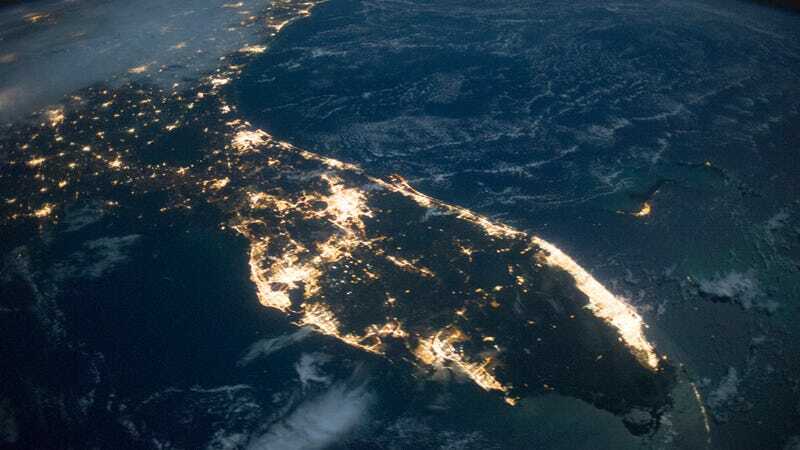 Using satellite-based sensors, an international team of scientists sought to understand if our planet’s surface is getting brighter or darker at night, and to determine if LEDs are saving energy at the global scale. With the introduction of solid-state lighting—such as LEDs, OLEDs, and PLEDs—it was thought (and hoped) that the transition to it from conventional lighting—like electrical filaments, gas, and plasma—would result in big energy savings. According to the latest research, however, the use of LEDs has resulted in a “rebound” effect whereby many jurisdictions have opted to use even more light owing to the associated energy savings. Indeed, as the new results show, the amount of outdoor lighting around the world has increased during the past several years. “As a result, the world has experienced widespread ‘loss of the night,’ with half of Europe and a quarter of North America experiencing substantially modified light-dark cycles,” write the researchers in the new study, which was published today in Scientific Advances. This conclusion was reached after analyzing high-resolution images collected by the Day-Night-Band (DNB) instrument that’s onboard the Suomi NPP weather satellite. This sensor features a spatial resolution of 2,460 feet (750 meters), and can “see” light in the range of 500-900 nm (humans see in the range 400-700 nm). Traditional lamps emit some infrared that the DNB can detect, and LEDs produce a lot of blue light that the sensor cannot see. 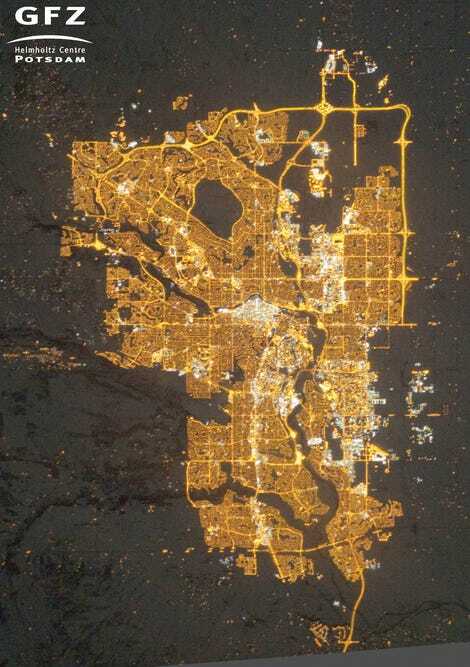 So as cities transition their outdoor lights to LED, scientists often see decreases in the light observed by satellite (which, to the human eye, would seem to have the same brightness). Researchers have been documenting the steady growth of artificial lighting ever since it was invented, and they’ve been wondering when the trend might stop. During the second half of the 20th century, electric light grew at an estimated rate of 3 to 6 percent per year. According to the new study, Earth’s artificially lit outdoor areas grew by 2.2 percent each year from 2012 to 2015, with a total radiance growth of 1.8 percent each year. During this span, nearly 60 countries experienced rapid increases in nighttime illumination between 110 to 150 percent, while another 20 countries experienced growth rates as high as 150 percent or more. Nearly 40 remained stable, with only 16 countries experiencing decreasing rates of nighttime illumination. Needless to say, and as Kyba pointed out, these rates weren’t consistent around the globe. In developed nations like the United States and Spain, illumination rates remained stable, but most nations in South America, Africa, and Asia experienced growth. In war-torn countries, such as Syria and Yemen, the rates of outdoor lighting decreased. The new study shows that, when it comes to nighttime illumination, most of the world is still playing catch up to First World outdoor lighting standards. Disturbingly, the results presented in the new study may actually be worse than the data suggests. As previously mentioned, DRB is not able to detect low-wavelength blue light, which humans can see. Our planet, therefore, is even brighter at nighttime than the data suggests. Barentine, who wasn’t involved in the new study, says the cost savings from the improved energy efficiency of LED lighting has been directed towards the deployment of more lighting, and with important environmental consequences both in terms of light pollution and carbon emissions. Nighttime illumination is considered a serious environmental pollutant, one that’s disruptive to nocturnal animals, plants, and microorganisms. But it’s also bad for human health as it disrupts the biological circadian rhythm, leading to metabolic disorders. University of Exeter community ecologist Thomas Davies, who’s not affiliated with the new study, says it’s no secret that artificial light at night is a globally widespread pollutant, but estimating the rate at which it is expanding has been technically challenging. Barentine says the solution to this problem is actually quite simple, but it’ll require us to gradually change our relationship with light at night. The most effective way to bring about these changes is through public policy, says Barentine, so we should encourage the encoding of these principles into local, regional, and national laws throughout the world. These solutions sound simple, and they’re certainly sensible, but it’s rather convenient for those of us in the developed world to impose such lofty standards onto places where nighttime light is being used for the very first time. Sure, we need to change the culture around the use of outdoor light, but let’s start this conversation in places where we already take nighttime illumination for granted.